What possible connection could early ’90’s Chicano gangsters in Los Angeles have with queer Black youth from the East Coast in 2015? Approaching their subjects from opposite sides of the country, working some twenty years apart, Salomón Huerta and Devan Shimoyama independently reveal a common archetype across disparate cultures and decades. In their work, “abjectness and recovered beauty are a parallel to the messiness of being male but also being human,” as Toro Castaño observed. They speak in the language of classical mythology and contemporary stereotype to illuminate a small fraction of what it means to be a young man in search of his own identity. 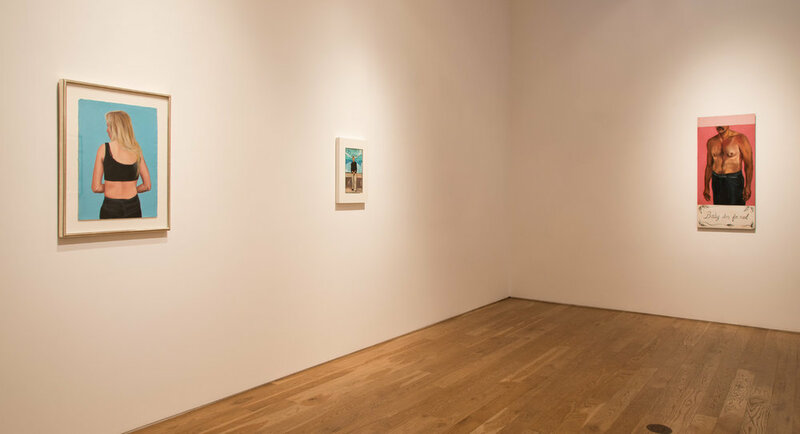 The placement of these two artists in adjacent galleries reveals the explicit yet often overshadowed foundations: separating and comparing the social environment as cause and camouflage for so much of what becomes a man. Shimoyama begins our acquaintance by defining his life as a performance and his body as a mask, then briskly gets on with the narrative. 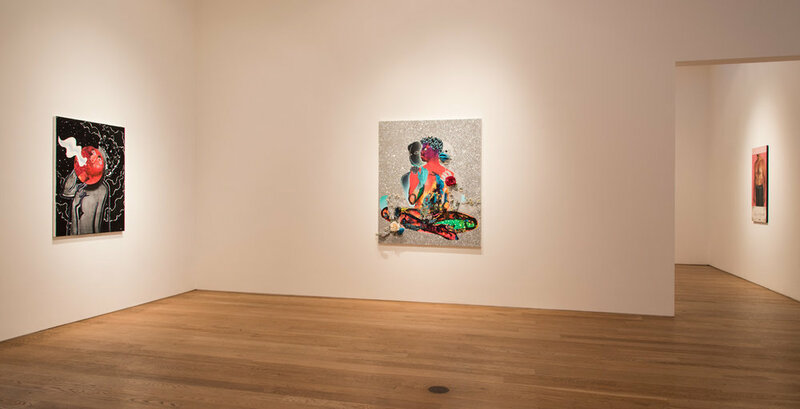 Glittering and exuberant, often despite a textual darkness, the paintings gathered for his debut exhibition in Los Angeles are purposefully stunning. Each is a self portrait in that he depicts his own body, but the depths of symbolism and narrative are hidden beneath his extravagant use of color and material. Green sequins, black glitter, crystals and neon paint, deep pools of ebony acrylic and swirls of undiluted color clamor for attention. This wealth of color and texture is draped across Shimoyama’s figures, each symbolically imbued with double and triple meaning in the sixteenth century manner. In the painting Daphne, (above) Shimoyama paints himself as the titular river Nymph ardently pursued by Apollo, a tragic figure who was turned into a laurel tree rather than be captured by love or raped by an amorous god, depending on the version you read. It is a slightly longer story, but as a modern parable for denial of oneself and rejection of romantic or sexual conquest, it is remarkably applicable. In the myth there are insults and enchanted arrows; in the painting there is a laurel wreath made of green-hued eyes, identity used as decoration to both declare and deny love from another. What story brought this composition together? Whether it was a personal experience or a fictional adaptation bears no weight; for Shimoyama, his body and image are a shared mask to be worn by artist and viewer alike. Salomón Huerta made the paintings shown here in the early 1990’s, when he was a similar age to Shimoyama now. These early works have not been widely seen, dating from a period just before his acclaimed run of “cooly detached” (per David Pagel) minimalist, stylized urban portraits that shot him to national attention. The paintings on view are just as taut, but more openly emotional than the later works he became known for. Raw and unfiltered, the depicted figures can be unsettling and even frightening to an outsider. The body language and the language written thereupon is meant to inform and intimidate, to immediately establish one’s place in society. Represented in Huerta’s capable hands, the message is very successful. 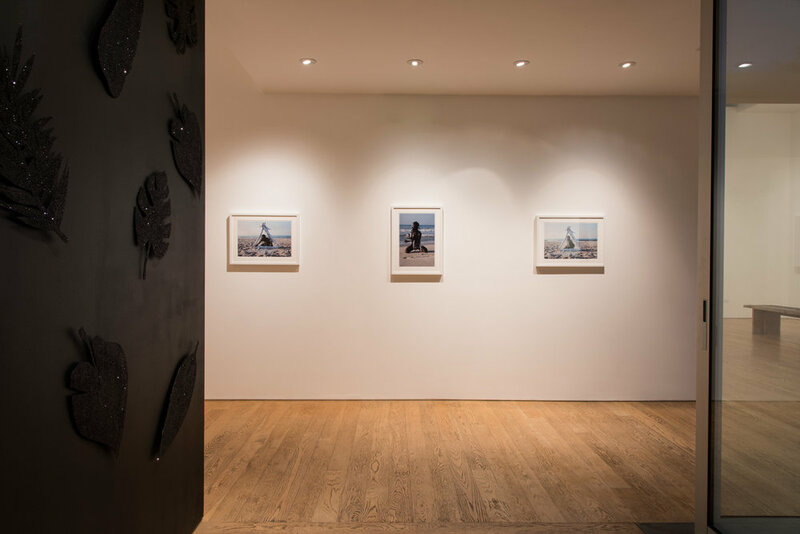 In fact, it is the seemingly culturally-specific symbology that finds echoes in Shimoyama’s paintings. Huerta’s early work reveals the universal aspect to be the posture behind the symbol, the perpetual rephrasing of the exact same desires in very different forms. 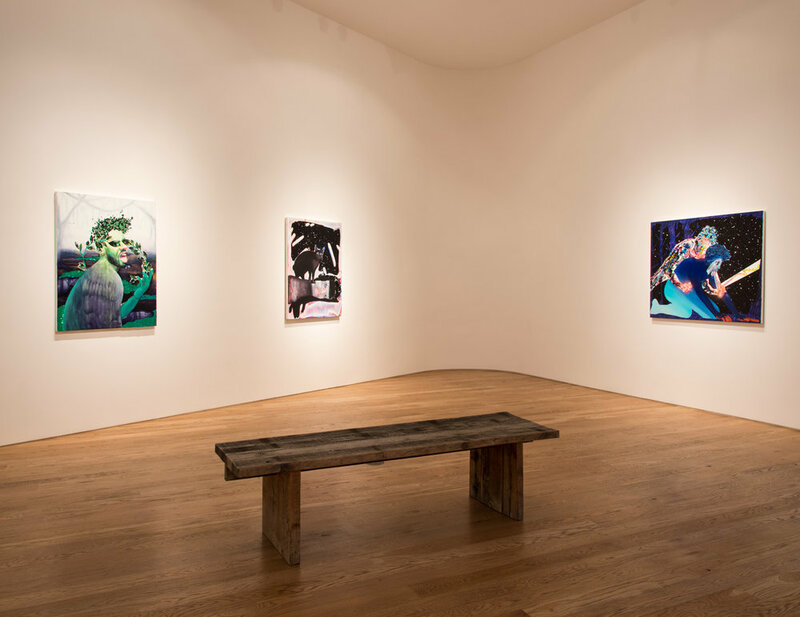 In conjunction with this exhibition we are pleased to announce the publication of an exclusive portfolio of five photographs by Devan Shimoyama. Created as part of an action undertaken during his Fire Island Artist residency in 2015, they are available individually or as a complete set, signed and numbered from the edition of 11. Image size is 19″ x 12 3/4″. The traditional wet-process Fuji Crystal Archive prints were produced and hand-spotted at Weldon Color Labs, Los Angeles, California. 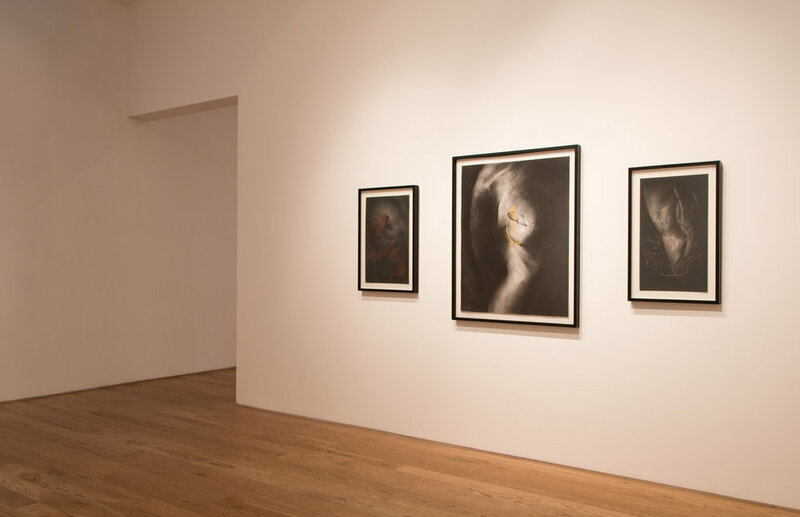 Please contact Kate Rosenheim at kate@samuelfreeman.com for pricing and current availability. Devan Shimoyama (Philadelphia, PA, 1989) lives and works in Pittsburgh, Pennsylvania. A graduate of Penn State and the Yale University School of Painting, Shimoyama recently participated in the Fire Island Artist Residency, and currently holds a teaching position at Carnegie Mellon University. Salomón Huerta (Tijuana, Mexico, 1965) lives and works in Los Angeles. He is represented by Christopher Grimes Gallery. His work has been included in the Whitney Biennial, Whitney Museum of American Art, NY, and exhibitions at Hammer Museum, Los Angeles, CA; National Portrait Gallery at the Smithsonian Institute, Washington, D.C.; Museum of Contemporary Art, San Diego, CA; Weatherspoon Art Museum, Greensboro, NC, and a solo exhibition of his paintings at Austin Museum of Art, Austin, TX. Huerta’s paintings are in the collections of Los Angeles County Museum of Art, Los Angeles, CA and Museum of Contemporary Art, San Diego, CA, among others. Toro Castaño is a curatorial assistant at ONE Archives at USC Libraries and an independent curatorial researcher based out of Long Beach, a graduate of UC Santa Cruz with a Masters from USC. He is a contemporary art book reviewer for The Library Journal, and occasionally provides research support to Semiotext(e) founder, Sylvère Lotringer. Castaño is closely involved with the Long Beach participatory arts scene where he is a facilitator at the Institute for Labor Garments Workers and Uniforms (ILGWU) in the Art Exchange. He is currently working on The Francis Effect, a project initiated by artist Tania Bruguera.